Use these belt grinders to finish, shape, and remove material quickly from metal workpieces. 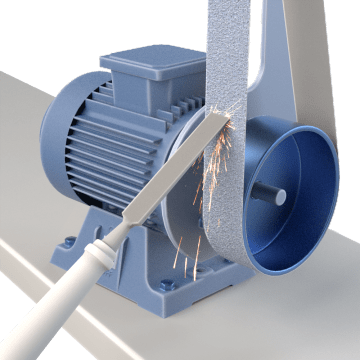 They have a long, wide abrasive belt that can cover a larger surface area than wheel grinders, providing faster material removal and resulting in a smoother, more even finish. A rubberized backing on the belts helps to stabilize the belt in the tool for a smooth finish.